With its mild and sunny climate, you will enjoy the popular beaches of New Zealand in the Bay of Plenty. This coastal strip of New Zealand enjoys a temperate climate where unspoilt rainforests and sub-tropical farmlands thrive. 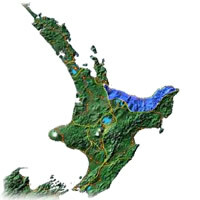 Tauranga, the main city, boasts the biggest harbour in the country for exportation. Mount Manganui beaches are well-known for surfing, and the region as a whole is popular for a wide range of outdoor adventure sports. We promote becoming as true partners with nature. What does this means? How can you get involved? Scroll through our free pictorial on line 'marine life tour' to get a taste of what partnership could look like. From our other web sites you can even build personalized reef modules. Or come and stay at our waterfront accommodation 'The Wharf Hub' for a real experience. The Junction has 25 different Tourist related businesses and is a fantastic place to spend a few days whilst on vacation in New Zealand. Accommodation, adventure activities, farm parks, and delightful café's. Very close to the legendary white sand beaches of the Bay of Plenty yet central to the 3 main city centres. Fun for all the family so do come and enjoy some genuine kiwi hospitality. The Tauranga and Rotorua region offers some of New Zealand's most spectacular scenery. Deep blue lakes surrounded by volcanic and geothermal backdrops, to long sandy beaches disappearing into the Pacific Ocean. Our scenic flights range from short local flights, providing a great view and the thrill of a helicopter flight to longer scenic flights that include White Island, Mount Tarawera and the Rotorua lakes. Looking to learn to Sail or Windsurf or would you like to Rent some Windsurf Kit or a sailing Dinghy? We have the very best equipment, professionally trained staff, and the perfect location. Learn to Sail a Dinghy, get hooked on Windsurfing, learn the art of Paddleboarding, introduce your child to Watersports or gain watersports Instructor Training. As Tauranga's Premier Charter boat company, Sunfish Charters offer a personalized service and exceptional value to our customers. Our modern offshore charter boat is designed and rigged for serious game and sports fishing and is available for private charter for fishing, diving, sightseeing and corporate events. Slipknot and Marilyn Manson tribute. Live jazz jam hosted by Tauranga Jazz Society. Book a table for dinner and listen to some amazing jazz tunes. Providing an interesting and unique market environment that is all inclusive to reflect our diverse community. Follow us on Facebook for updates on stallholders who will be at the markets.